ADIN Iron & Steel, Inc. has the experience to load and transport extra heavy hauls. We have the knowledge to lift, load and transport those extra large pieces and to do them on time and within budget. We can do a detailed analysis of your inventory's value based on current market and handling cost. Our cutting crews can reduce your oversized material with torches or we can cut material down to size with shears mounted on excavators. Let us help you develop a plan to best manage your scrap, salvage, demolition or surplus projects. 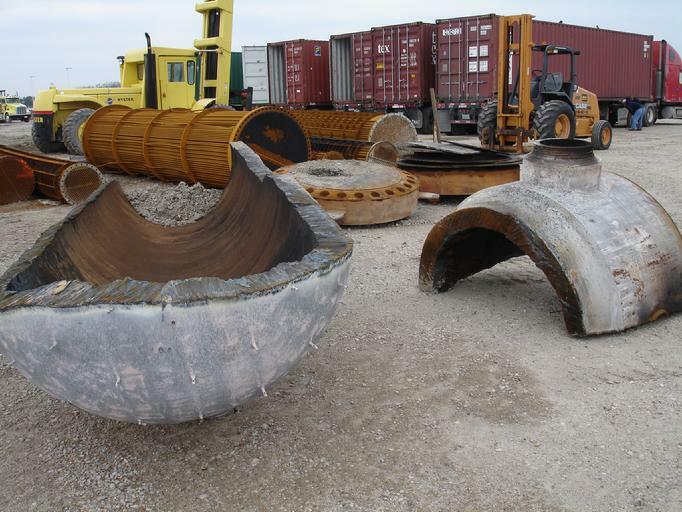 Our experience and knowledge gives us a definite advantage over other scrap metal processors. ADIN Iron & Steel, Inc. will tailor each of our services to meet your needs. Our Project Management service begins with a thorough analysis of your individual needs. Is it a one-time "cleanup" with a roll-off box; a daily, weekly or monthly removal service switching roll-off boxes; or, perhaps, a large scale project which will involve massive cranes, police escorts and strict safety guidelines and plans? Once we establish a clear understanding of your expectations and requirements, we move on to the next step. What type of material will be scrapped? It is necessary to be clear on the identification of the material. High tech analyzers are used to determine the grade of each scrapped item. This service is called PMI or Positive Material Identification. It is this knowledge that not only allows us to market your material for the best return, but also determines any special handling necessary, such as permitted loads or regulated materials calling for more detailed and specialized removal. No matter what your specific needs are, ADIN Iron & Steel, Inc. can deliver the appropriate service. Our experience in this market is only exceeded by our determination to get the absolute highest return on your material. We thoroughly research the scrap metal market, domestic and international, and get you the highest possible price for your scrap. Once we have established the type and grade of material and its market value, we then give you a detailed proposal for your review so you know exactly what to expect. ADIN Iron & Steel, Inc. handles every type of material and salvage with the most efficient and experienced transportation companies available. From cranes for loading to all permits and police escorts, we maintain the highest quality of service available. Our transportation contacts have long been established. From over-the-road to railway to shipping overseas, we have experience in all modes of transport.